George Prescott Bush (born April 24, 1976) is an American corporate lawyer, former U.S. Navy Reserve officer, real estate investor, and politician who serves as the Commissioner of the Texas General Land Office. A fourth-generation elected official as a member of the Bush family, he is the oldest child of former Florida Governor Jeb Bush, a nephew of the 43rd President George W. Bush, and a grandson of the 41st President George H. W. Bush, after whom he is named. Bush's middle name is taken from his great-grandfather, Senator Prescott Bush. Bush was born in Houston, Texas, to Jeb and Columba Bush (née Garnica Gallo). Bush has two siblings: younger sister Noelle Lucila Bush and younger brother John Ellis Bush, Jr. In 1994, Bush was arrested for burglary in the Killian area of Miami, Florida, but not charged. He attended law school at University of Texas School of Law, where he earned a Juris Doctor degree in 2003. Like his grandfather and uncle (both at Yale), Bush was a freshman walk-on to the baseball team at Rice University, but left the team by his sophomore year. Bush played quarterback for the Jones College intramural football team. He was also featured in People Magazine's top 100 Bachelors in 2000. After law school, he clerked for U.S. District Judge for the Northern District of Texas, Sidney A. Fitzwater. Bush managed St. Augustine Partners, an energy and technology-focused investment firm in Fort Worth, Texas. Previously, he co-founded Pennybacker Capital, LLC, a real estate private equity firm in Austin, Texas. The firm was originally named N3 Capital and headquartered in Fort Worth. Bush left Pennybacker Capital in 2012. Before entering the real estate investment business, he practiced corporate and securities law in Dallas with Akin, Gump, Strauss, Hauer & Feld LLP. In 2005, Bush was selected as one of Texas Monthly's "Rising Stars" for his work with Akin Gump. On March 21, 2007, the United States Navy Reserve announced the selection of Bush for training as an intelligence officer through the direct commission officer program, a Navy initiative whereby applicants in specialized civilian fields forgo the typical prerequisites of a commission, such as the Naval Academy, NROTC or OCS, and – instead – attend three weeks of Direct Commissioned Officer Indoctrination Course (DCOIC) classes on subjects such as naval history, customs and courtesies, followed by online classes. Bush told The Politico that attending the October 2006 launch of the aircraft carrier named for his grandfather – the USS George H.W. Bush – inspired him to join the service. He also called the death of Pat Tillman, the NFL player and Army Ranger who was killed in a friendly fire incident in Afghanistan in 2004, "a wake-up call". Bush served in Operation Enduring Freedom for eight months and returned to the United States in 2011. During that deployment, he was given a different name for security purposes. Not even those he was serving alongside knew his real identity. Bush left the U.S. Navy Reserve on May 9, 2017 at the rank of Lieutenant. At the age of 12, Bush spoke before the 1988 Republican National Convention, which nominated his grandfather. He also spoke at the 1992 convention on the occasion of George H. W. Bush's renomination. He campaigned for his uncle, George W. Bush, during the 2000 and 2004 presidential campaigns. In his speeches he stated support for his uncle's position in favor of comprehensive immigration reform. When asked in 2003 about whether he planned to run for office himself, Bush replied that his grandmother, Barbara Bush, had advised that anyone thinking about entering politics should distinguish himself in some other field first: "Make a name for yourself, have a family, marry someone great, have some kids, buy a house, pay taxes, and do the things everyone also does instead of just running out and saying, 'Hey, I'm the nephew of or the son of or the grandson of...'"
As of 2012[update] he was the deputy finance chairman of the Republican Party of Texas. He was ranked one of "Newsmax's 50 Most Influential Latino Republicans" in 2016. His father ran in the 2016 Republican presidential race, but later dropped out. After his father's exit from the race, Bush campaigned for Donald Trump as chairman of the Texas Republican Party's effort on behalf of Trump. Most of the remainder of Bush's family refused to campaign for Trump. As of June 2013[update], Bush had raised $3.3 million even though no Democratic candidate had emerged for land commissioner. On November 19, 2013, he officially filed the papers to run for Texas land commissioner. In the November 4 general election, Bush faced Democrat John Cook, a former mayor of El Paso. Bush won 61% of the vote, riding a nationwide Republican wave in the midterms. He is the only Bush to win his first election. He received a majority of the Hispanic vote in his general election race. On June 19, 2017, Bush announced he would run for re-election to the Texas Land Commissioner position, focusing on veteran issues, protection for the Gulf Coast from future disasters, continue to renovate the Alamo, and financing Texas children's education. As of January 2017[update] he had about $3.1 million in campaign cash for his re-election campaign. Bush won the March 6, 2018, Republican primary with nearly 58% of the vote, defeating three other candidates including Jerry E. Patterson, the previous land commissioner. Bush handily kept his Commissioner position as he won with a victory margin by over 10 percent, defeating Democrat Miguel Suazo and Libertarian Matt Pina in the November 6, 2018, general election. Bush received 53.68% of the vote to Suazo's 43.19% vote total. Aside from governor Greg Abbott, he was the only statewide incumbent in Texas to win by double digits in 2018. Bush assumed office on January 2, 2015. Bush has also managed an ongoing $450-million remodel of the Alamo and surrounding plaza in San Antonio. In May 2015, as Texas land commissioner, Bush organized fundraising for future development of the San Antonio historic site, The Alamo. British singer Phil Collins donated various Alamo-related artifacts to the State of Texas with the stipulation that the State of Texas build a facility to hold the artifacts within a seven-year period. The Texas state legislature has agreed to a one-time infusion of $25 million to Bush's General Land Office to re-develop The Alamo site and the city of San Antonio has agreed to provide $1 million for the re-development. In February 2016, the League of United Latin American Citizens Council No. 12 in Laredo, Texas, announced that Bush and José Antonio Meade Kuribreña, the head of the Mexican ministry of social development, would both receive the titles of "Señor Internacional," a designation used since 1976 to honor distinguished figures in the border region as part of the annual Washington's Birthday Celebration. Bush dismissed some one hundred land commission employees hired under the preceding Commissioner Jerry Patterson. According to the San Antonio Express-News, Bush paid almost $1 million in taxpayer funds to encourage the dismissed personnel not to file suit against either him or the agency. He kept at least forty persons on the payroll for up to five months after terminating their employment; they agreed in writing not to sue. In 2016, the office began a multi-year study on the flood effects of the Houston area and Texas coast. Bush married a law school classmate, Amanda L. Williams (born 1979), on August 7, 2003, in Kennebunkport, Maine. Williams is a media law attorney at the firm Jackson Walker LLP in Fort Worth, Texas. The couple has two sons. ^ "Texas Births, 1926–1995". Familytreelegends.com. Retrieved August 15, 2009. ^ a b c d e f g h Associated Press. George P. Bush starts small, shuns idea his name, Hispanic heritage can save GOP in Texas, Washington Post, July 20, 2013. ^ Parker, Ashley (January 5, 2016). "Jeb Bush Drops Guard to Share Family Account of Addiction". New York Times. Retrieved August 25, 2016. ^ "Gorgeous George". AustinChronicle.com. Retrieved April 18, 2017. ^ Fenton, Ben (August 8, 2000). "George P 'held on burglary charge at 18'". Retrieved December 5, 2018 – via www.telegraph.co.uk. ^ "From A Nut To Some Soup". The Smoking Gun. July 1, 2010. Retrieved December 5, 2018. ^ Russell Contreras (August 11, 2000). "Gorgeous George". The Austin Chronicle. Retrieved October 12, 2006. ^ Thompson, Angie (January 6, 2007). "George P. Bush to speak for MLK Day". Tifton Gazette. Retrieved September 23, 2015. ^ a b Dan Glaister (August 31, 2004). "He's young, good looking, and Hispanic – could he be the next George Bush in the White House?". London: The Guardian. Retrieved March 22, 2007. ^ Guevara-Castro, Lillian (May 5, 1999). "Florida's First Lady: Columba Bush settles into life in the governor's mansion". Ocala Star-Banner. Ocala, Florida. Retrieved March 22, 2015. ^ "George P. Bush, nephew of former president, reportedly makes campaign filing in Texas". Fox News. Associated Press. November 9, 2012. Retrieved August 25, 2016. ^ "N3 Capital Partners Becomes Pennybacker Capital". Reuters. August 18, 2008. Retrieved August 15, 2009. ^ "NSRW to host George P. Bush at Bentwater". The Courier. October 12, 2013. Retrieved August 25, 2016. ^ "Maverick PAC - Leadership". MaverickPAC.com. Archived from the original on February 16, 2015. Retrieved April 18, 2017. ^ "George P Bush :: Hispanic Republicans of Texas". hispanicrepublicansoftx.org. Archived from the original on March 4, 2016. Retrieved February 10, 2016. 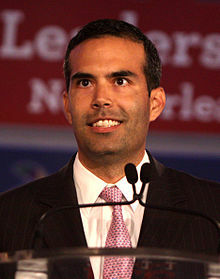 ^ "George P. Bush: New Kid on the Political Block". newsmax.com. Retrieved February 10, 2016. ^ "Officer Training Command, Home of Navy OCS - DCOIC". Archived from the original on September 24, 2009. Retrieved February 10, 2016. ^ Curtis, Bryan. "A Bush Goes to War". The Daily Beast. Retrieved October 26, 2009. ^ Dykes, Brett Michael (October 27, 2009). "Bush family political heir is shipping off to war". Yahoo News. Retrieved October 28, 2009. ^ George P. Bush (February 16, 2011). "'Gampy' inspired me to serve". USA Today. ^ "George P. Bush to Address RLC 2011 « RLC 2011". rlc2011.com. Retrieved February 10, 2016. ^ "'Next Bush' makes campaign filing in Texas". Retrieved December 4, 2018. ^ "George P. Bush calls himself a retired Navy officer. FALSE". Retrieved December 3, 2018. ^ "021518 gpbushrecordnavy". Retrieved December 3, 2018. ^ Mark Stevenson (August 22, 2004). "Bush nephew faults policy at Mexican border". Orange County Register. Retrieved March 22, 2007. ^ Bachelor Bush to Change His Ways Soon June 30, 2003, People (magazine). ^ "Topic Galleries". OrlandoSentinel.com. Archived from the original on February 25, 2009. Retrieved August 15, 2009. ^ "Rubio nabs George P. Bush; Jeb still mum". The Hill. January 21, 2010. Retrieved April 30, 2010. ^ "Maverick PAC – George P. Bush". MaverickPAC.com. Archived from the original on October 2, 2013. Retrieved April 18, 2017. ^ Weissert, Will (November 14, 2012). "Dad: George P. Bush eyeing Texas land commissioner". Associated Press. Retrieved November 14, 2012. ^ "Newsmax's 50 Most Influential Latino Republicans". Newsmax.com. Retrieved April 18, 2017. ^ a b c d Wissert, Will (June 19, 2017). "George P Bush seeks re-election as Texas land commissioner". Associated Press. New York City: Star Tribune Media Company. Archived from the original on June 19, 2017. Retrieved June 19, 2017. ^ Dixon, Schuyler (November 9, 2012). "'Next Bush' makes campaign filing in Texas". Associated Press. Retrieved November 9, 2012. ^ a b Slater, Wayne (December 17, 2012). "Bushies with Karl Rove connections host George P. Bush DC fundraiser". Dallas Morning News. Archived from the original on December 31, 2012. Retrieved January 2, 2013. ^ "Jeb Bush to donors: Help my son". Politico. November 14, 2012. Retrieved November 15, 2012. ^ a b George P. Bush launches political career on Twitter, Houston Chronicle, March 12, 2013. ^ "George P. Bush Runs for Office in Texas". Wall Street Journal. March 12, 2013. Retrieved March 12, 2013. ^ Satija, Neena (October 28, 2014). "All Eyes on Land Office if George P. Bush Wins". Texas Tribune. Austin, Texas. Retrieved October 28, 2014. ^ "George P. Bush makes state candidacy official - Houston Chronicle". Chron.com. Retrieved August 15, 2014. ^ a b "Republican primary election returns". team1.sos.state.tx.us. Archived from the original on March 7, 2014. Retrieved March 6, 2014. ^ Ross Ramsey (July 19, 2011). "Patterson Confirms He'll Run for Lieutenant Governor". Texas Tribune. Retrieved July 26, 2013. ^ "About Watts". wattsfortexas.org. Retrieved February 11, 2014. ^ "Ex-El Paso mayor John Cook runs for Texas Land Commissioner". KVIA. November 13, 2013. Archived from the original on February 22, 2014. Retrieved February 11, 2014. ^ "George P. Bush". The Texas Tribune. ^ Stableford, Dylan (November 5, 2014). "Election 2014 firsts". Yahoo News. ^ "George P. Bush Seizes Conservative Spotlight". The Associated Press. Dallas, Texas: CBS Radio Inc. February 5, 2015. Retrieved February 6, 2015. ^ Allbright, Claire (March 6, 2018). "George P. Bush Wins Republican Primary Race for Texas Land Commissioner". The Texas Tribune. Retrieved March 7, 2018. ^ Platoff, Emma (November 7, 2018). "Four top takeaways from the 2018 Texas midterm elections". Texas Tribune. Austin, Texas. Retrieved April 10, 2019. ^ "Race Summary Report, 2018 General Election". State of Texas, Office of the Secretary of State. Austin, Texas. November 6, 2018. Retrieved April 10, 2019. ^ Marfin, Catherine (November 6, 2018). "George P. Bush wins re-election as Texas Land Commissioner". Houston Chronicle. Houston, Texas. Retrieved April 10, 2019. ^ a b McCrimmon, Ryan (May 18, 2015). "George P. Bush Headlines Red Carpet Alamo Event". Texas Tribune. Austin, Texas. Retrieved May 28, 2015. The premiere doubled as a fundraiser for the Alamo Endowment, an organization working with the Texas General Land Office to maintain and operate the Alamo complex. The state recently took over management of the Texas shrine after ending its longstanding partnership with the Daughters of the Republic of Texas. ^ a b c Batheja, Aman (May 28, 2015). "Budget Deal Includes $25 Million Boost for Alamo". Texas Tribune. Austin, Texas. Retrieved May 28, 2015. ^ "40th annual Senor Internacional announced". Laredo Morning Times. February 6, 2016. Retrieved February 10, 2016. ^ Brian M. Rosenthal, "Bush kept paying workers he fired", San Antonio Express-News, May 22, 2016, p. 1. ^ "In Maine, One Bush Wedding and A Fish Story". washingtonpost.com. August 8, 2004. Retrieved August 15, 2009. ^ "Bush's daughter reels in a big fish". MSNBC.com. August 7, 2004. Retrieved August 15, 2009. ^ "Media savvy Attorney Amanda Bush sharpens her focus on law – and on Fort Worth". fwbusinesspress.com. Archived from the original on September 28, 2007. Retrieved August 15, 2009. ^ "Jackson Walker LLP Profile". jw.com. March 24, 2009. Archived from the original on October 30, 2009. Retrieved August 15, 2009. ^ Bradner, Eric (April 13, 2015). "Jeb Bush welcomes fourth grandchild". CNN. Retrieved April 13, 2015.